Rain or shine, enjoy staying in your patio with a cover overhead to protect you from the elements. To make sure your patio cover doesn’t ruin your existing house’s exterior look, here are some patio cover options you can choose from. 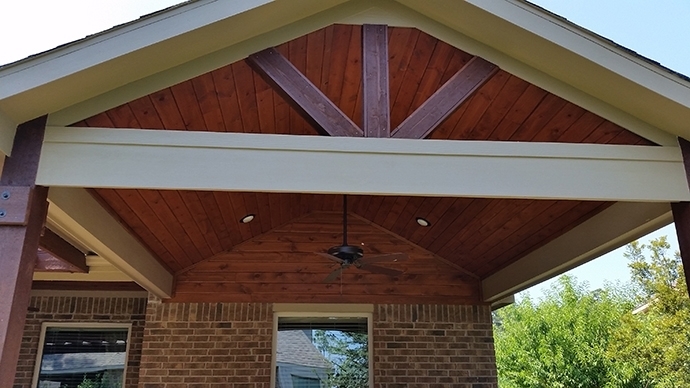 As simple as it gets, this straightforward patio cover can easily meld with any house exterior. If you’re a minimalist homemaker, this one’s for you. A gazebo fits perfectly over a patio overlooking your yard. It can be structured with sections which can be placed strategically to your favorite parts of the garden. Another favorite among gardeners, fuse your outdoor structure with your garden with a pergola. Keeping your patio cover well-lit and airy, you can either use drapes or have it run over with idyllic vines. A vertical trellis for privacy usually accompanies this type of patio cover. Usually built with transparent roofing material, turn your patio into a faux greenhouse with a sunroof. With a sunroof, you can keep your potted plants in the patio and still have them receive enough sunlight. This is perfect for gardeners who love to continue their hobby without soaking in the sun all day long. Let the sun shine through the roof yet still keep you and your plants comfortable. With an A-type roofing style, gables are a favorite especially for patios mainly designed as a social space for your family and friends. With enough overhead space, it gives enough buffer for wind to pass through and heat to dissipate. Looking for the unusual? Then a curved patio cover will do that for you and your curb appeal. If your house looks like an avant-garde specimen for architectural design then a curved patio cover will surely uphold your aesthetic needs.